The ever increasing unemployment rate, should set the alarms bells ringing. We need to focus on the solution by empowering us to use our fast resources of labour to address our housing problem. If the government cannot provide affordable houses then it is our responsibility to provide a solution. The underlying principle is simple. The value of a currency relates to the productivity of the nation. We will not attract foreign capital, turn the rand around, succeed in attaining single digit inflation and lower the interest rates until our people are firmly on the road to prosperity via harnessing their own potential. Much is said about the need to increase employment. Waiting for formal business or the Government to create more jobs can NEVER provide more than a fraction of the answer. We must follow the international experience of developing nations by freeing up the potential entrepreneur who lurks within a high proportion of all our citizens. The People's Housing Process is the most promising initiative to emerge from our fledgling beleaguered government and MUST SUCCEED if we are not to sink into a third world morass of inefficiency corruption and crime. 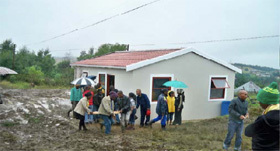 By promising to fund Housing Support Centers that comprise groups of about 200 households who are willing to participate in building their OWN HOUSE at R500 per household, Government have given us the best opportunity yet, to solve our problems. Government is short of funds. Local authorities are emerging from a process of wrenching change, and many NGOs still struggle to survive. 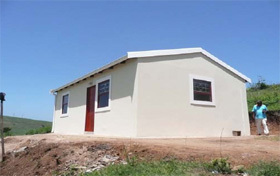 South Africa has produced many hundreds of frustrated individuals, who have invested many years and capital in devising self-build, quality, and energy saving housing systems that are best suited to our needs, but have failed to realize their vision due to a combination of community suspicion of new technology, and bureaucratic complexity. 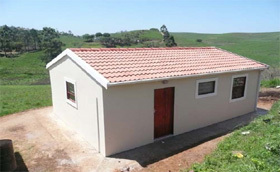 South Africa cannot afford to deliver completed houses that are built by contractors and handed over before the R20000 consolidation subsidy is paid? That is impractical, has not worked, and will never work. People tend to get a tiny matchbox of a house of ever reducing size, that is built with the cheapest materials and labour available which comprises a health hazard, and creates more frustration and resentment than anything else. This is what the People's Housing Process is all about. People need dwellings that are of a good quality, of a design that reflects individual needs and taste, and FROM WHICH THEY CAN WORK. There is no doubt that when the owner is personally involved in the construction of the house, the quality of finishes is much higher than when delivered by a hard pressed contractor. Direct involvement results in pride of achievement and good quality. Training in basic business skills. The resulting lifting of the living standard of urban dwellers is then permanent, and provides a much higher productive base for employment in the formal sector. It follows that the need to turn to crime for a living reduces in proportion. This is the international experience. Other developing countries have traversed the same path, and have learned the same lessons. We just happen to be rather far down the road, but learn we must. The Readykit Housing patent cavity walling system fulfills the need for housing to be of the highest quality, energy efficient and affordable. The system was designed specifically for assisted self-help housing projects where the aim is for the community to have a say in the size, design and finishes of each unit, which in most cases is intended to be a workplace as well as a home. The Readykit product is not only waterproof, bullet proof and has a 60 minute fire rating. It is also extremely energy efficient, and healthy. Our people are desperate for a technical solution to help overcome the respiratory problems that result from excessive exposure to wood or coal fires in an enclosed environment. TB is a growing scourge that is fuelled by the absence of dwellings that provide effective insulation from damp and cold. The housing subsidy will pay for at least half the erected 40sq-m unit plus the entire foundation. Training is provided to give the necessary skills to the owner to be able to complete the process and extend the house in future as additional funds are available. The training at that stage is linked to a program that identifies potential for the creation of a small business and identifying what extensions if any are required to the dwelling. The Readykit solution works, but is not the only one around. We need to encourage all entrepreneurs who have devised practical self-help housing systems to bring them to the party in the confident knowledge that if they deserve to succeed. The financial environment is in place to enable it to happen and the time to do it has arrived.